Ergonomic dog harness. Handmade in Italy. 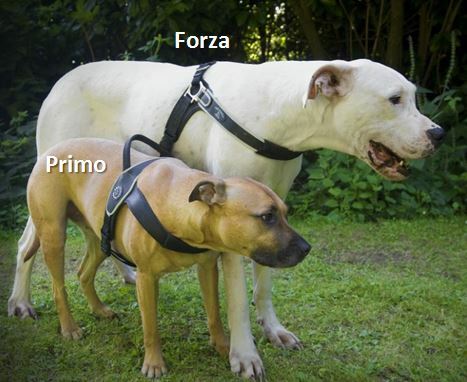 The Forza and Primo harnesses are specifically tailored to the build of larger dogs, as from 10 kg. The Tre Ponti models for large and small dogs are different, because the build and the position of the shoulders are different for large and small dogs. - The basic principle of both harnesses is the same: simple put on: over the head and click around the chest. No step in model. - Optimum liberty, they fall far behind the armpits, so no irritation or tangles in the armpits. - Anti-allergic materials, and get barely wet. Don't hold water. => This is in contrast to most dog harnesses, where a lead is attached to a ring that is fixed in one place. Therefore those harnesses turn on the body as the dog changes sides . This model is characterized mainly by the top handle. Because the ring to which the leash is attached glides smoothly over it, you constantly keep control and grip on your dog without the harness rotating. Primo harnesses can also be used very well as cycling, jogging or step harnesses. This harness must be worn always perfectly fitted , as it does not automatically tighten if the dog tries to escape, as the Forza does. This model is characterized by the "loop" over which the ring to attach leash smoothly glides. Because of this the harness does not rotate. This "loop" principle also ensures that the harness tightens when the dog pulls the leash. However, with the ergonomic design of the harness it does not cause pain or irritation because it does not touch a negative pressure point . - The dog does not wear the harness tight. If the dog tries to escape he will pulls the leash and automatically tightne the harness. So this harness is safe, even for escape artists. - The dog will feel as if you hold him around the chest. He will look back at you to see what is going or start to walk slower. By rewarding this reaction, with traits or otherwise, the pulling can be manageable and with the right approach even completely unlearned. Ignore the reaction of the dog and the dog will learn that it has no meaning and no longer pay attention to it. So it is important, as it is with all positive corrections, to work closely with your dog. - Dogs with a wide chest that are at the extreme end of the size description, often require a size larger. - For greyhounds which easily escape from their harness, the Forza preferred, since it tightens if the dog pulls forward or backward. - If the chest size of your dog leans to the smallest size in centimeters of the range, then choose a smaller size if you want the Primo. Since the Primo generally fals larger than indicated by Tre Ponti. - If the chest size of your greyhound leans to the smallest size in centimeters of the range, also choose the Forza in a size smaller, since these harnesses fall far behind the armpits and therefore in most greyhounds further then the largest part of the chest. - In case of medium dogs from 10 to 12 kg it depends on the front width of their chest if the Primo or Forza is the ideal harness is for them. So it depends on whether they have the typical physique of a large or small dog. The ideal situation is that the dog can fit the harness so that we can see what size is best, and also what type of Tre Ponti harness best suits the figure of the dog. Can not you come into the shop in Antwerp, you can always ask our assistance via e-mail. Do add the breed, weight of your dog and the girht/chest size.